Want to embed a Powerpoint presentation in a page or a post? Like this? You will need a Google Drive account to do this. Either upload the Powerpoint file to Drive or at it to your Drive folder on your computer. Go to your list of files in Drive and open the file. 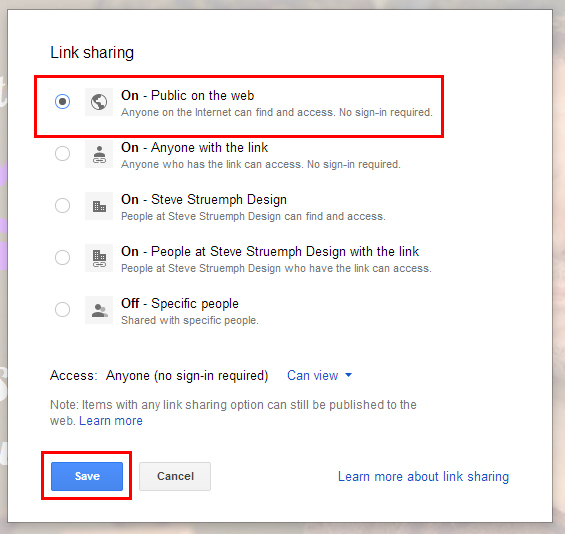 Click Open, then click Open again so it says “Open with Google Slides”. This will convert it to a Google Slide file and open it in Google Slides. Click on Embed and set the size and other settings. Click Publish. When you click Publish you will be presented with the embed code for WordPress. Copy the code. Go to your WordPress page or post where you want to embed the presentation and make sure you are in the Text editing mode rather than Visual. Copy and paste the code to your editor and publish your page or post. You might need to do this but I did just in case. 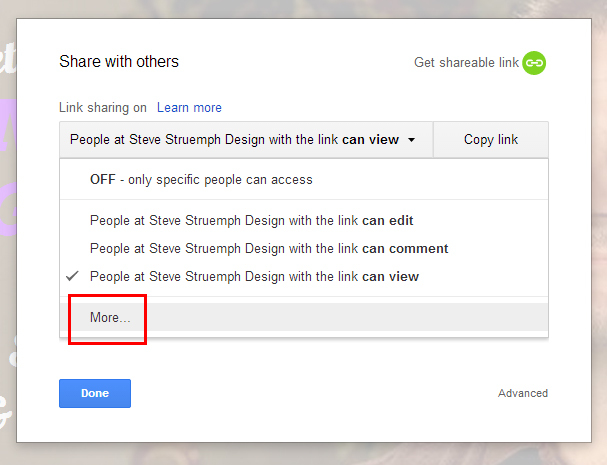 Go back to the file in Google Slides and with the file open, click the Share button in the upper right. Then click More as seen below. Choose the appropriate level of sharing. I set mine to Public on the web. Navigate to your post in WordPress and you should have a nice, clean, Powerpoint presentation with navigation embedded right into your website. File > Publish to Web seems to no longer be an option. 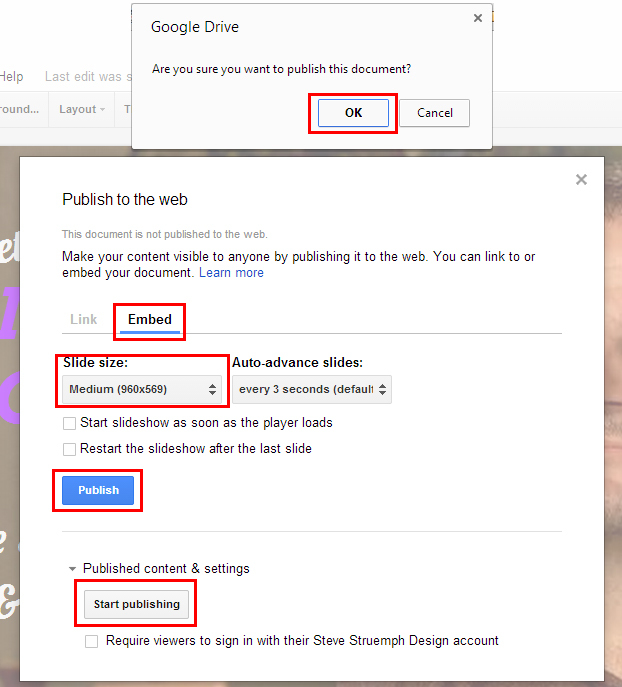 At least, when I open my PowerPoint presentations in Google Slides, I find I cannot locate a “Publish to Web” option. THANK YOU! THANK YOU! THANK YOU! I struggled with this for two hours before I found your article. Easy Peasy 1,2,3 and my Power Point was embedded onto my site. Thanks for guiding. Any ideas on settings for expanding the slides to fullscreen – from inside WP – for use in conferences etc.? 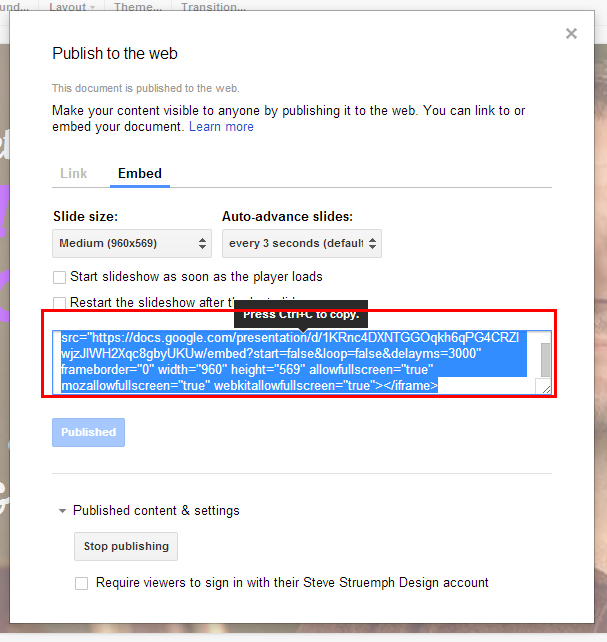 I see the iframed url generated in Google Slides contains “allowfullscreen=”true” mozallowfullscreen=”true” webkitallowfullscreen=”true”> – but I need help to understand the syntax options..